Fifty miles east of LA, a once sleepy area dominated by citrus groves and farms, is now the country's largest logistics distribution hub. The barns and orchards have been replaced by warehouses. Lots of them. In fact, warehouse space in the region totals 1.1 billion square feet, and it's growing. Commercial developers are building new distribution centers with high confidence that manufacturers, retailers and third party logistics providers (3PLs) will continue to be attracted by the area's benefits as a distribution location. KANE became one of the most recent entrants into the Inland Empire market when customer demand led to the opening of KANE's modern Inland Empire warehouse outside of Rialto, California. Why do companies want to be in the Inland Empire? Well, it's just 65 miles from the country's largest port complex and right next door to the nation's second most populous city. More than 75 percent of California's imported cargo is being shipped through the Inland Empire network. These DCs distribute goods to all areas of the U.S. Sure, there are warehouses closer to the ports in Los Angeles County, but they are in short supply and they cost more to rent to lease, according to data from industrial real estate firm CB Richard Ellis. 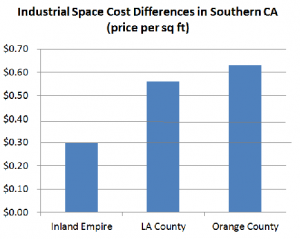 Inland Empire warehousing is simply the lower-cost alternative in the region. The Inland Empire's logistics-based economy is now growing, but things were not always so bright. Toward the end of 2008, unemployment skyrocketed and surplus 3PL warehousing and distribution space soared to 36 million square feet. But with the country's economic recovery, the area is on the rise. Vacancy rates for industrial space have fallen from 9% in 2009 to 5.4% today, close to historical lows. (CBRE). Much of the recent expansion of Inland Empire warehouse space is due to the rise in online retail sales and the related need for ecommerce fulfillment space. Amazon opened a one million square foot fulfillment center there in late 2012. And real estate developers say a large percentage of companies now searching for space will be using the facilities for fulfillment warehousing. KANE's new Inland Empire warehouse is a food grade facility that supports the needs of multiple customers for distribution services. The facility features a large, fenced lot with 84 trailer spots. It is two miles from the West Colton rail yard and seven miles from the BNSF intermodal facility in San Bernardino. Value-added services include cross docking, deconsolidation and contract packaging. If you have a need for West Coast distributionsupport, contact us at 888-356-KANE (5263) or info@kaneisable.com.